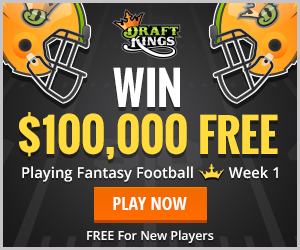 What Are The Best Daily Fantasy Sites? We know you trust Top Daily Fantasy for reviews and site recommendations – and we take that seriously. We only recommend sites that we know to be the best and most trustworthy. We also only recommend sites that we play on and trust for own daily fantasy games. With that said, at this point when considering prizes, number of players, bonus and promotions and safety, there are only two sites we feel comfortable fully supporting and recommending: DraftKings and FanDuel. These sites are far and away and two biggest sites out there right now, and for good reason. They provide the best experience for the player from depositing to picking and following your teams to ultimately withdrawing your winnings. There are no better sites out there whether you’re just starting up or you’re a seasoned DFS player looking for a new site. Check out our reviews for Draftkings and FanDuel and remember – not only do we know the DFS industry, we are players at these sites too, so you can trust we have the experience to provide a great overview for both sites from the player’s perspective. We are also always reviewing new sites to find places we can recommend you play at and collect bonuses at.